If you spend a lot of time in bed reading or working on your laptop, you know how uncomfortable it can be to find a supported position. You don't want to lie on your back, but hunching up against the headboard isn't comfortable, either. These specialty support pillows are structured in such a way that you can sit up in bed with full back and neck support so you’ll remain comfortable. Our favorite is the LinenSpa shredded foam reading pillow. Reviewers say that it is an inexpensive and comfortable pillow whether you're reading in bed, working on a laptop, recovering from surgery, or even to prop up breastfeeding mothers. It arrives rolled-up and compressed- buyers say that if you toss it in a dryer for 15 minutes it will emerge ready to use. These sit up pillows come in many designs, but most are placed against the bed’s headboard or against a wall. You then recline against it and read or relax. When looking for a reading pillow, buyers recommend making sure you have enough support for your back, especially your lower back, as that’s where you’ll likely feel the most fatigue. Also, look for a fabric that’s breathable so you won’t get too hot. Foam filled pillows come highly recommended for their firmness and breathability (Source). The Vercart Wedge Bed features lumbar support and a navy blue removable cover for easy washing. Comes in various sizes; the one we looked at measured 39x7.9x19 inches. Buyers were mixed with some saying it didn’t offer enough support and others saying it was quite comfortable. Next we looked at the Brentwood Home Zuma Therapeutic Foam Bed Wedge Pillow. This sit up pillow measured 10 inches and is made in the US from knit fabric. It’s gently sloped to help people with respiratory problems and to reduce neck and shoulder pain by supporting correct posture. The 100% polyurethane foam is flexible, yet firm and most buyers rated this pillow very highly for its comfort and ability to help them sit pain free. 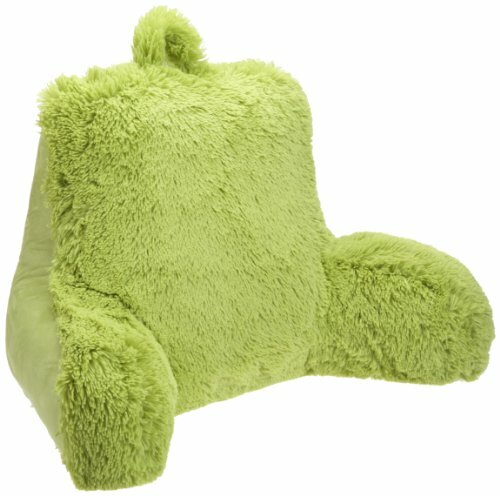 The Shagalicious Bedrest is a unique support in that it can be used while reading in bed or sitting on the floor watching TV and the colors make it a little more fun. It features a handle for easy carrying and would make a great gift for the dorm or the kids room. It’s not very large, however, which makes it more ideal for younger people. Some buyers say that while the shaggy covering looks neat, they felt it trapped heat making them too warm at times (Source). The Keen Edge hypoallergenic Shredded Foam support pillow is shaped similarly to the Shagalicious pillow, but is more geared towards adults with its removable cover and hypoallergenic foam. This pillow is perfect for reading or watching TV in bed, and the removable cover is easy to wash. Users have been very satisfied with this and say it’s both soft and sturdy and gives plenty of support. The Linenspa Shredded Foam Pillow is similar to the Keen Edge pillow in that it’s the same design and uses the shredded foam. Unlike some other reading pillows, this comes with a 3 year warranty, which is nice, especially if you have young kids. The shredded foam provides for better airflow making it cooler and more comfortable when you sit for a long time. 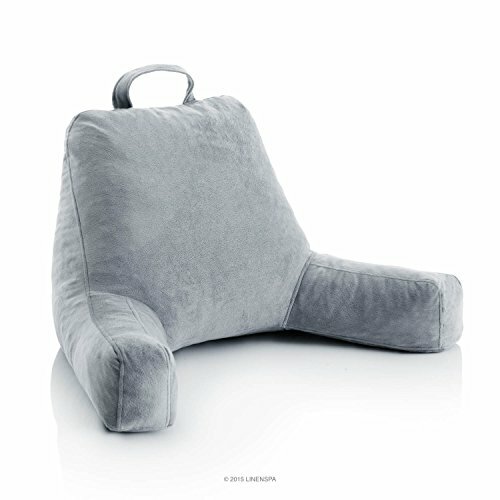 This reading pillow also features a convenient handle for easy carrying. This pillow needs to “inflate” after unpacking, and some buyers suggest speeding up the process by putting it in the dryer for a few minutes (Source). One reviewer even told it was it was the best breastfeeding pillow they've ever used. 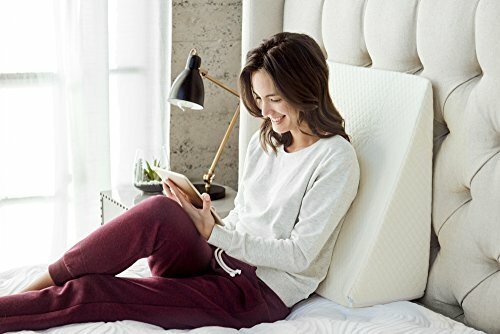 The Linenspa shredded foam reading pillow could be a solid option if you are looking for cozy comfort while reading or watching television. Users love the handiness of this bedding accessory, but some do complain about its height. This reading pillow is filled with shredded shapeable foam clusters, which, it is said, keeps its loft longer, is less likely to shift, and doesn’t clump in one spot. According to the manufacturer, it features a durable cover made of cozy velour that is both soft and breathable. In addition, its plush and durable velour cover in a neutral stone color is claimed to provide a soft surface. It is available in standard and XL size. This item might be a solid choice if you want a reading pillow that can be molded for personalized comfort. In general, buyers have a very favorable opinion of the Linenspa velour cover reading pillow. They agree that it is comfortable and soft. Users conclude that it is well-made and supports well. However, some purchasers do complain about the height, stating that the pillow isn’t tall enough for total comfort. As one online reviewer shares, the back support doesn’t actually extend up far enough to provide any real support. If you are looking for a cooler for new generations of CPUs, you might want to consider the Corsair H60 model. Users like the cooling performance of this product, but some do complain about the noise. This product is a CPU cooler that offers improved performance at lower noise level thanks to a120mm fan. It features a micro-fin copper cold plate for superior heat dissipation, low-profile pump for easy installation and better airflow and low-profile black aluminum heat exchanger. This item could be a solid choice for those who want to upgrade from their stock CPU fan or bulky air cooler to the efficiency and simplicity of liquid CPU cooling. In general, users state that the Corsair H60 CPU cooler meets their expectations. They agree that it works great and keeps the temperature low. Users add that the installation is simple. However, some do complain about the fans being loud when running in performance. A frequent complaint is that the item is huge. If you’re looking fora top-rated reading pillow, you might want to consider the Brentwood Originals bed-rest. Users love the vibrant color of this bedding accessory, but some complain about insufficient stuffing. This reading pillow features a convenient, sturdy handle attached to the top. The manufacturer states that the pillow is easy to clean with only a damp cloth. You can choose between hot pink, lime, and turquoise color. This item might be a good choice for individuals who want excellent support for their neck, back, and arms while watching TV, reading, or relaxing. The general user consensus concerning the Brentwood Originals Shagalicious bed-rest is that it is very comfortable, soft and fluffy. Purchasers appreciate that it comes in vibrant colors. However, some buyers complain that it can be a little too soft in the sense that it doesn’t provide as much support as it could. Therefore, purchasers agree that it would be better if the pillow had more stuffing. 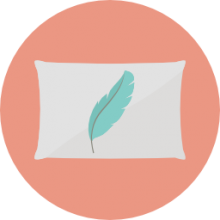 The Brentwood Home therapeutic foam bed wedge pillow is a solid option for those who have conditions where breathing may be impaired in a supine position. Users like the usefulness of this bedding accessory, but some complain that it is too firm. This therapeutic pillow features a gradual slope which is said to provide perfect support for your upper body or legs, and that it can be used as a trunk stabilizer for lying on your side. The manufacturer states that the pillow is made of hypoallergenic CertiPUR-US Certified Foam, without ozone depleters, PBDEs, TCEP flame retardants, mercury, lead, and formaldehyde. It is available in two sizes, namely 10’’ and 12’’. This product might be a solid option if you are suffering from acid reflux, snoring, breathing difficulties, poor circulation, hiatal hernia, back or neck problems. The general user consensus concerning the Brentwood Home bed reading pillow is that it is well-made, comfortable, firm and supportive. Many buyers state that it really helps with acid reflux and snoring. However, some buyers complain that the pillow is too firm and hard. There are complaints of an unpleasant chemical odor. The VERCART large filled triangular wedge cushion backrest is a solid option for someone who wants a soft and comfortable pillow with good permeability. Users like the usefulness of this bedding accessory, but do complain about the poor quality and loose stuffing. According to the manufacturer, this reading pillow is filled with high-quality PP cotton, with good elasticity and durability. It features a corduroy cover that has a zipper closure for easy removal. The pillow is available in 11 colors and various sizes. This item seems like a solid choice if you want a comfortable and ergonomic pillow. There are mixed reviews concerning the VERCART lumbar pad with a removable cover. Users agree that the pillow is comfortable, very puffy, as well as that it is solid and doesn’t flatten. However, many dissatisfied buyers complain that the pillow they received is far from the one shown in the pictures, quality and firmness-wise. As they state, the stuffing in their item is loose, clumping and uneven, which makes the pillow look very wrinkled and lumpy. When you've had a long and tiring day, nothing feels better than getting into your bed for a good night's sleep with some supportive pillows. After you have brushed your teeth, washed your face and have slipped into your comfortable sleeping clothes and are snug and cozy in your bed, you might have trouble thinking up ways in which you could feel better. For people who are avid book readers, going through a novel in bed before falling asleep is the answer. After you have become all snug and comfortable in bed, there is nothing better than enjoying a novel for a few minutes, or even hours (if the book is gripping enough, you might end up reading it up to the point where you would usually wake up in the morning). Whether you are perusing a physical copy of a book or reading a novel from an e-reading device, there is nothing better to get rid of the stresses and tensions of the day. You can improve upon this by adding a gadget or two to enhance your bedtime reading experience. So whether you want to give a gift to a book lover, or just want to indulge yourself, read on to get some tips on what to get. If you are savoring a physical, hard copy novel, or are reading on an e-reader without a backlight, then you need to have a proper source of light. This can be a problem if you are sharing a bed with your partner and don't want to disturb their sleep by turning on a light, such as a bedtime lamp. However, you can overcome this problem by simply buying a convenient clip-on light such as the Fulcrum Book Light. When you start getting too sleepy to read any further and just want to go to sleep, you can use a cute and dainty bookmark to mark your place in the book. If you are enjoying a good story in bed while the cold season is ongoing, then you will probably have faced the problem of finding it hard to keep your upper body warm and cozy, as that part of your body is not covered by a blanket while you are reading. You can overcome this problem by getting a warm throw that you can spread over your shoulders while you are reading. If you get a heated throw, that makes it all the better.